Ashtavinayak yatra is just for two days. Shree Chintamani of Theur which means the one who is in search of happiness, whose conscious brain is waver like lord Brahama, who is in the midst of all calamities should go to Theur and worship Shree Chintamani and get rid of all the worries and chintas. Theur is nearest place of Ashtavinayak yatra from Pune having fabulous grandness, Theur is popular for a number of reasons. Shree Moreshwar of Moregaon which means O! Lord Mayureshwar of Moregaon, you reside on saliva jadbharat’s land on the banks of river karha which is known as ‘Bhuswanand’. Shree Moreshwar, who is without any form, who resembles Omkar, who is in fourth state of yoga and who rides on peacock may accept my saluation. Shree Siddhivinayak os Siddhatek means Lord Shree Hari Vishnu, who was surrounded by ferocious calamities, performed repentance on mountain Siddhatek which is on the banks of river Bhima. On receiving blessing from Lord Shree ganesha, Lord Vishnu ruined two devils. Oh! Lord Siddheshwar Shree Ganesh accept my greeting. 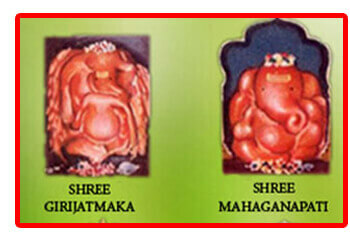 Shree Mahaganpati of Ranjangaon meaning Lord Shivshankar obtained a boon by propitiating lord Shree Ganesh. I salute Shree ganesh who stays at Manipur, who gave blessing to Mahadev, whose appearance is beautiful and pleasing and who is statue of good qualities. Mahaganpati has eight, ten or twelve hands. Shree Vighneshwar of ozar meaning let my middle mind be concentrated to God, who is elephant headed, gracious and remover of obstacle. He has defeated demon Vighnasur. He himself is Brahama. He is greatest creative person, He gives happiness to his devotees, who abodes at ozar. Shree Girjamaj Vinayak of lenyadri which means Mother of universe, beautiful wife of Lord Shiva Goddest Parvati performed long penance of Shri Ganesh and at last obtained Shree Ganesh as her son.Shree Varadvinayak of mahad which means I salute Ganaraj who is leader of Ganas, who is proud of his devotees and who abodes at Mahad and has pleasant appearance. Mahad has a beautiful surrounding so many scets had recided in this place. Shree Ballaleshwar of pali meaning I worshipped god Ganesha, who is elephant headed, who has been worship in Vedas, who is approved by the name of his devotee, who takes care of his devotees and in this kritayuga who abodes is pali. We provide our customer Ashtavinayak yatra from pune by car by their convenience and at a very affordable rate which you can check at our website.